Last year I did not issue this post but friends are requesting for recipes. 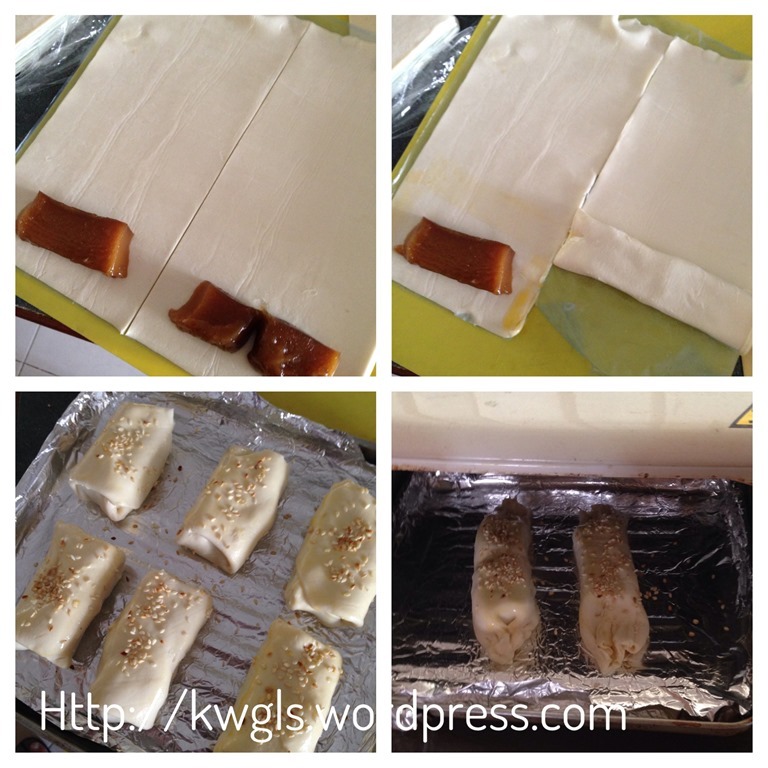 It is not a recipe actually, it is just a way to serve nian gao or Chinese glutinous rice cake and I have to say that this is not my invention, it is a trend especially among the English speaking members of Facebook Group for the past few years. 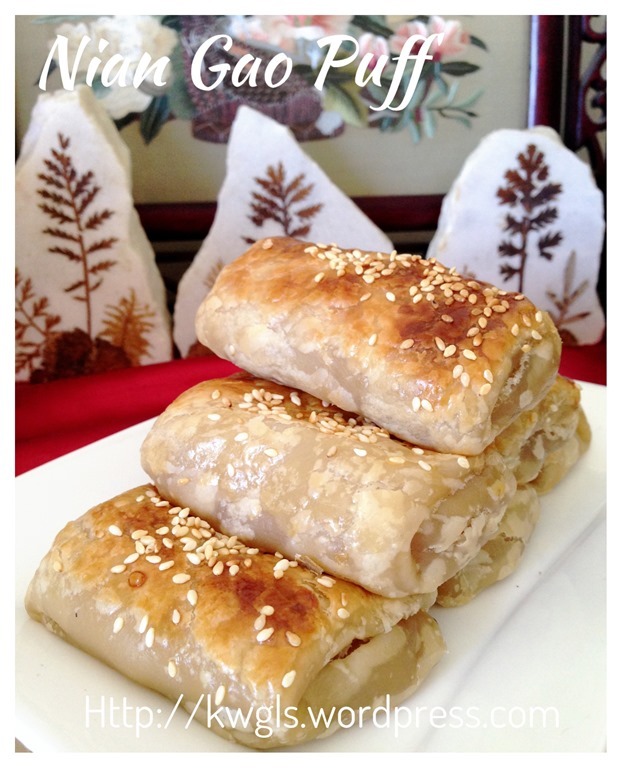 In recent years, nian gao wrapped in commercial puff pastry had become very popular after Chinese New Year. 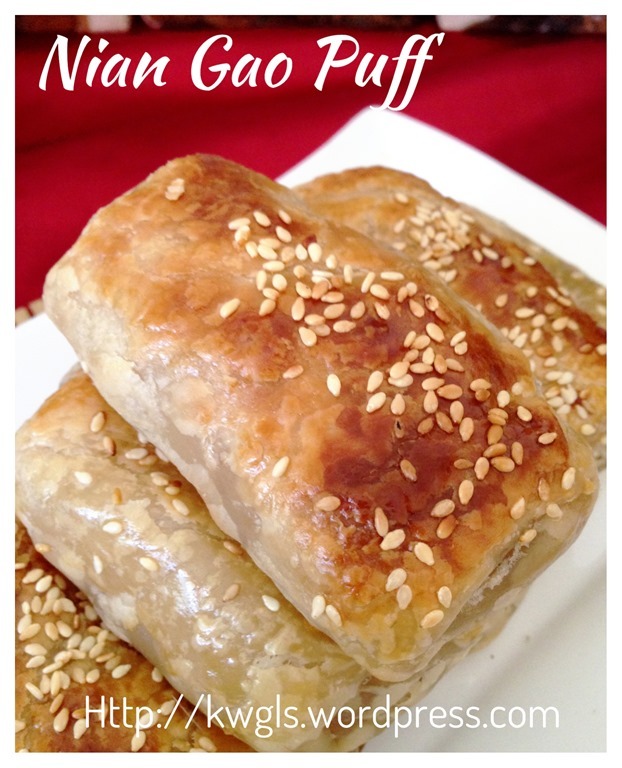 Prior to this trend, most families will deep fry the nian gao or re-steamed it and served it with shredded coconut. For this illustration, i have used commercial puff pastry. However, if you are game enough to have some homemade puff pastry, you can refer to my croissant posts : Home Made Croissants (家居自制牛角包） It is the same type of puff pastry that were sold by the supermarkets. As my in built oven broke down and waiting for repair , I have resorted to the use of oven toaster with no temperature control. As such, the pictures are not as appealing as it should be because there are some signs of under baking. Do not worry, any puff pastry will come with a baking instruction, do follow the packaging instruction and it will be fine. Should i re-prepare again, I will have another session of photo taking. Pre-heat the oven to 200 degree Celsius or as per packaging instructions. 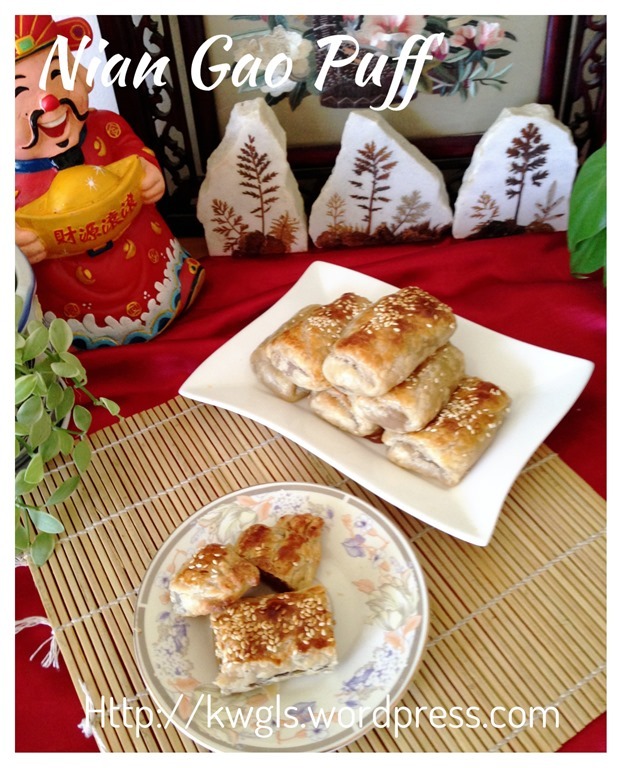 Lay some nian gao on top of the puff pastry. Wrap it in your desired pattern and seal the edges. Egg washed the pastry, sprinkled with sesame seeds and bake in the pre-heat oven of 200 degree Celsius for 20-25 minutes (or according to the packaging instructions). 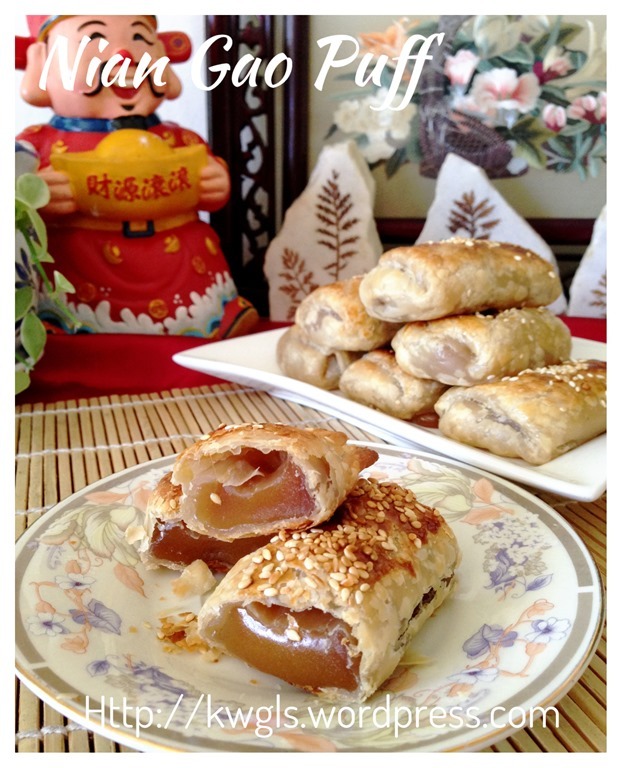 I am using freshly homemade nian gao, as such it is slightly softer than commercially sold. 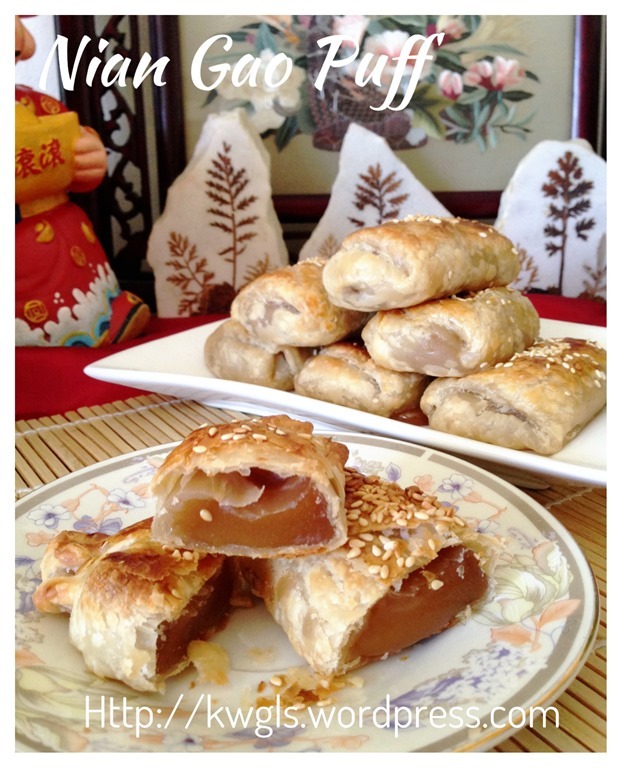 If your nian gao turns hard, it will have a much better shape than those illustrated here. For egg washing, crack one egg yolk with one tablespoons of water, mixed well, sift and brushed. You can have put your desired nuts be it macadamia, walnuts, peanuts etc. 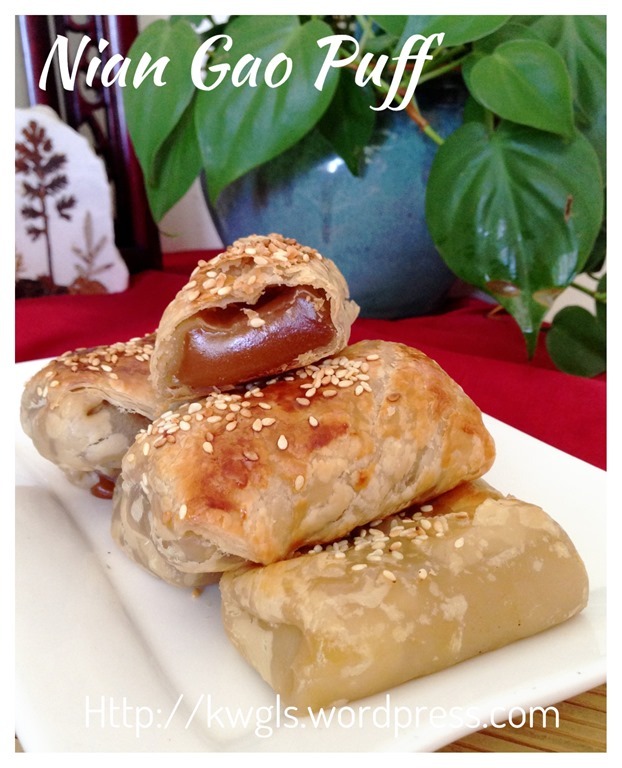 to the nian gao before wrapping to provide some crunchy to the nian gao puff. 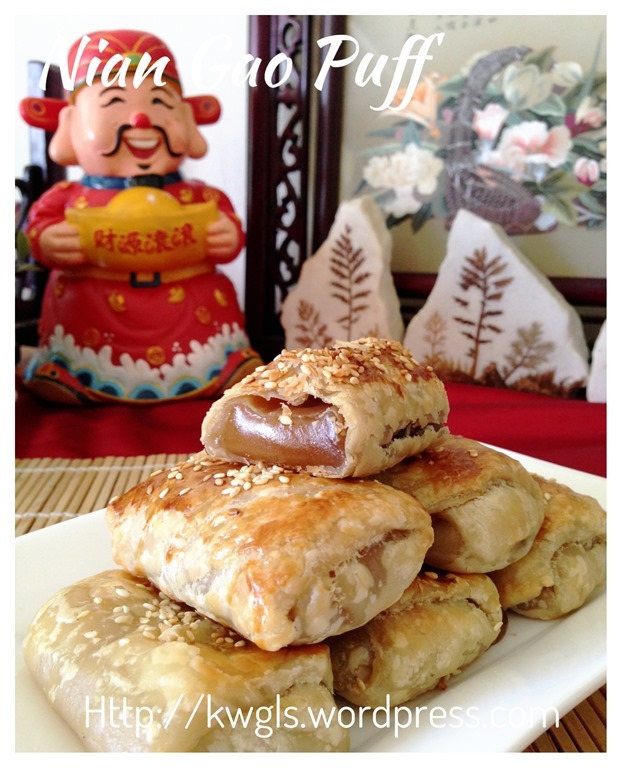 Nian gao, when baked will expand. Do not wrap it overly tight. 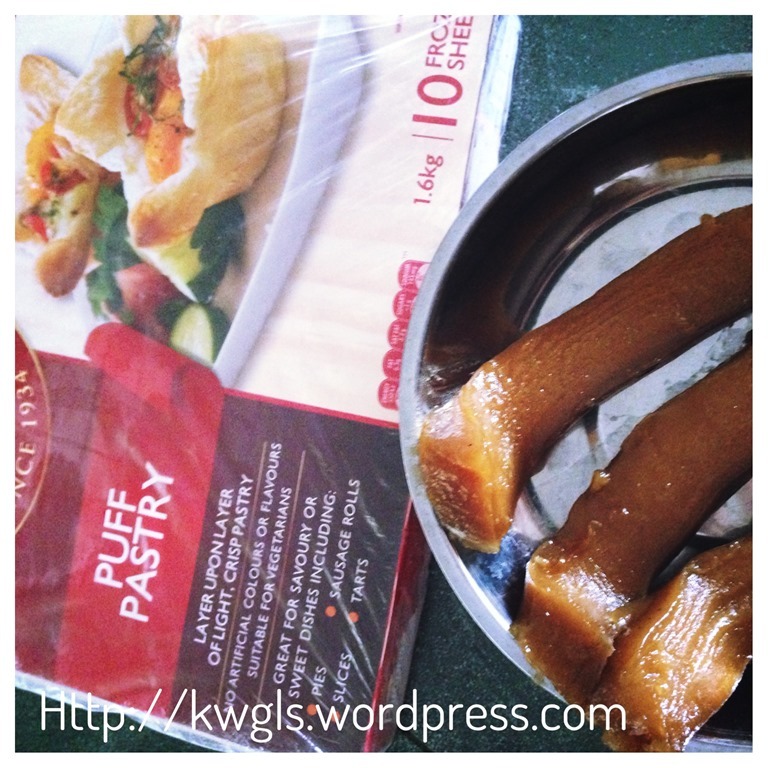 You can also use a scissor to cut some holes on top of the puff pastry prior to the baking. For oven toaster, I have baked for about 20 minutes without temperature control. Therefore, some parts looked slightly under cooked. This way of serving is extremely easy. Whether or not it is healthier as compared to deep frying is up to individual to decide. .. Once you baked any commercial puff pastry, you will know the answer.. Haha. Possibly the healthiest way of serving the nian gao is to re-steam the nian gao and served with shredded coconut. 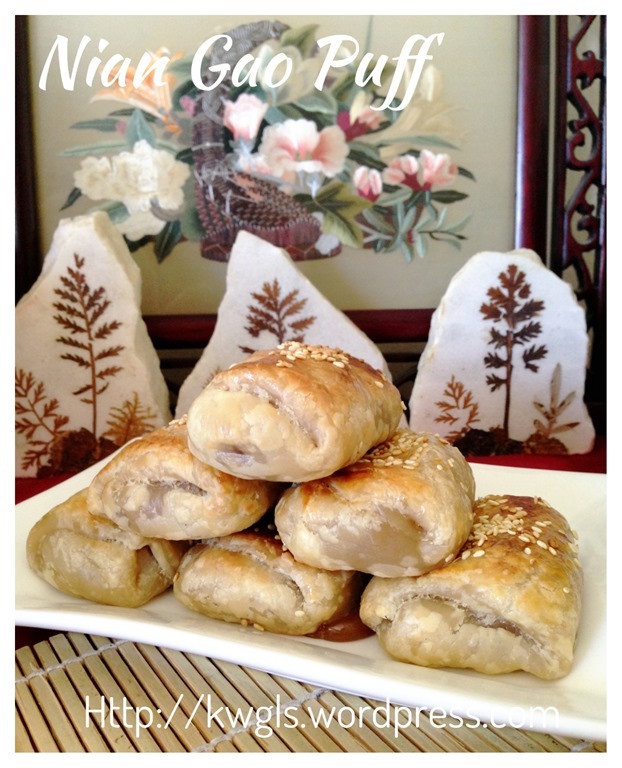 This entry was posted in Chinese and Asian Cakes and Snacks, Food Preparation Series, Snacks and tagged 8, 酥脆烘年糕, GUAI SHU SHU, Guaishushu, kenneth goh, nian gao puff, niangao puff, postaday. Bookmark the permalink. 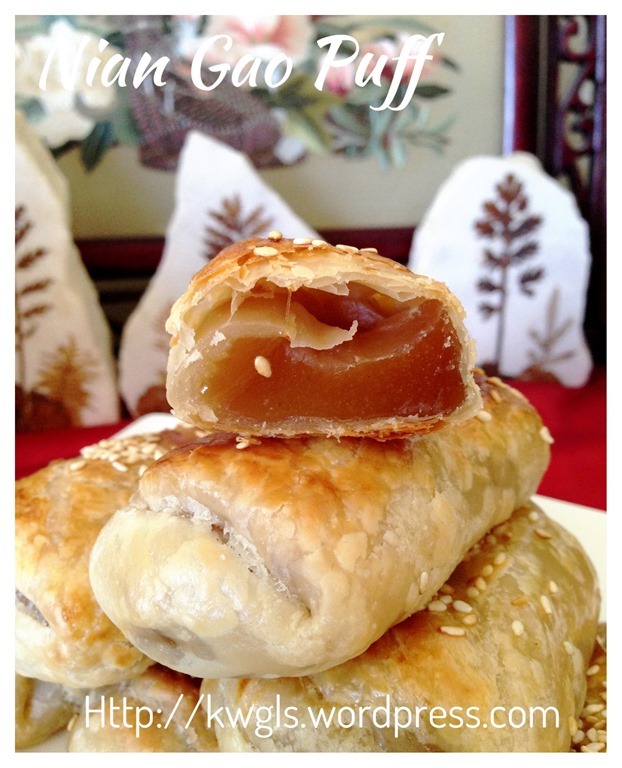 Thanks for sharing this creative way of serving nian gao. 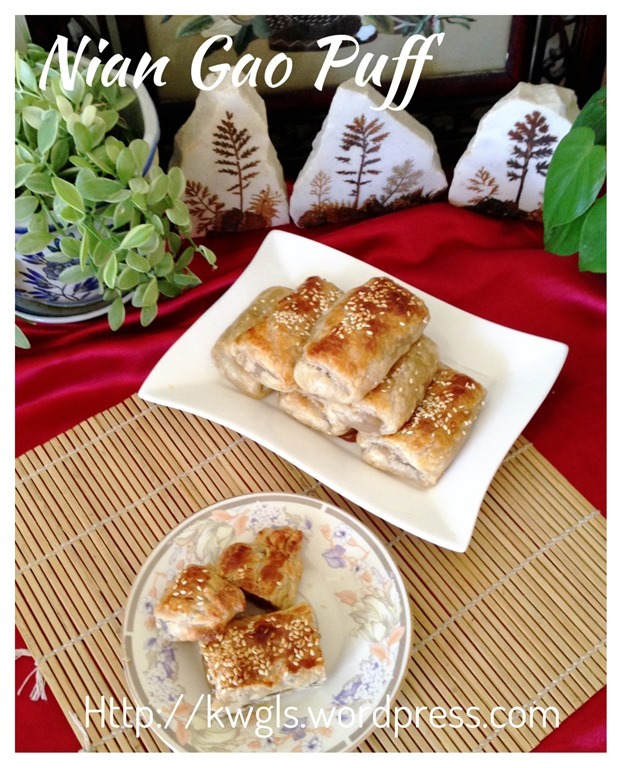 What do you think of substituting the puff pastry with roti prata (store bought)? Should be a good try. However, I have never try baking roti prata though. can only drool over this.. keekee..